Located on the outskirts of Paris, this low-cost hotel offers free Wi-Fi access and a 24-hour reception. It is just 15 minutes on the Metro from central Paris. A flat-screen TV with satellite channels is provided in the soundproofed guest rooms. Each contemporary guest room has a private bathroom with a hairdryer. 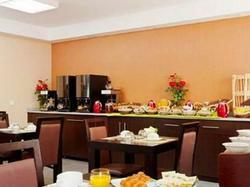 Enjoy a buffet breakfast every morning while reading the daily newspapers provided at the Comfort Hotel. After breakfast, guests can use the computers at reception. Charles de Gaulle Airport is just a 15-minute drive from the Comfort Hotel. Bobigny Pablo-Picasso Metro Station is 2 km away. Free private parking is available on site. The soundproofed rooms include a flat-screen TV, a telephone and a private bathroom.